It is undeniable that we live in a world of information overload. Check out Internet Live Stats to be truly ‘infowhelmed’! Just one second of internet traffic…. As busy people, it is often at precisely the wrong time that we find that fascinating article, or when we are looking for something else that we discover a great resource for the future. Keeping track of all of this digital information is important – we all know how quickly our time is sapped away while searching online. Fortunately, there are a number of tools that are easy to use, and which we can use to manage our digital information, so that we can virtually ‘file’ and share with others the quality articles, resources and media to be easily drawn upon again, or to be read at a later, more suitable time. 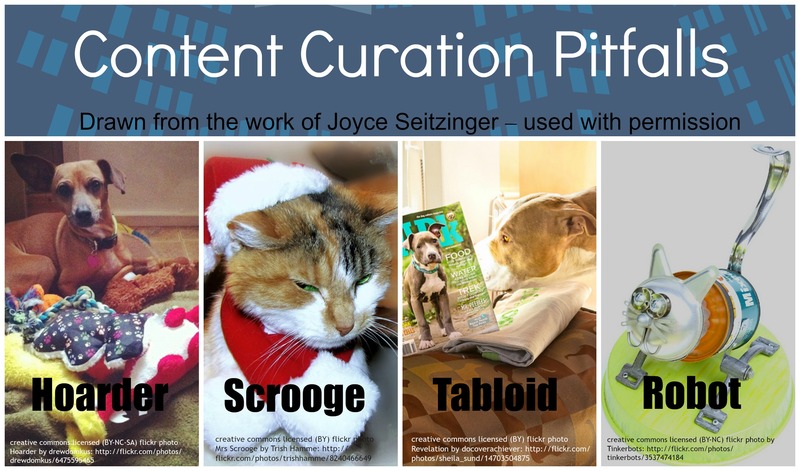 So how does one ‘curate content’? Using these tools effectively requires skills in ‘content curation’. Traditionally the term curator refers to someone who looked after objects in a museum exhibition. A new and increasingly popular definition of content curation is the act of selecting and collating digital content, organising it so that it may be better used to meet a particular need. Beth Kanter has an excellent Primer on Content Curation, where she hastens to point out that curation is not simply an aggregation of links; it is a process of strategic collection, where what is left out is just as important as what is included. It is also an editorial process, where context specific knowledge is added the each digital resource, and then delivered via a tool that best suits the needs of the identified audience. This sounds more complex than it is. More simply, it means finding quality digital content, evaluating it for a particular purpose, adding extra information for those most likely to use this context within that particular purpose, and sharing it with those users. I’m a teacher/student- do I really need to do this stuff? Content curation has always occurred in schools – resources were always gathered around the topic of teaching, in order to support and extend student understandings. The difference is that in the past, this consisted of gathering ‘hard’ content – books, posters, newspapers, kits etc (and these were usually gathered together by the teacher librarian, the leading content curator in the school). Nowadays, the teacher librarian and teachers not only have access to these resources, but also to a huge range of digital resources – many of which provide fantastic, engaging learning opportunities for today’s students. Content curation enables this huge range of resources to be arranged in a usable, accessible way. Students too can benefit from learning effective curation skills as being able to quickly and critically evaluate a range of information sources, and then curate these into a meaningful collection is a vital research skill. Content curation is even becoming a study skill which is explicitly taught to students. Be the best curator you can be – avoid the pitfalls! The Hoarder: a curator who collects everything indiscriminately, who doesn’t organise their content, and doesn’t share – this is really closer to simple aggregation than curation. The Scrooge: one who, similarly hoards their information – although they may organise their collection, they don’t share either; one of the key purposes of educational content curation! The Tabloid (or National Enquirer): a collector who indiscriminately collates everything together, and generously shares this aggregation, whether others want/need it or not! The Robot: a curator who uses tools to shares automatically, with no context related additions or value adding; in this case, the curation is really no better than providing a list of Google search results. Avoiding these pitfalls is what differentiates the effective content curator from those simply ‘collecting’ content. It’s all a bit much – are there tools to help me? The task may seem overwhelming; however, as I mentioned above there are many fantastic tools to make the process streamlined and simply part of the work of the day. Keep in mind that not everyone will like every tool. That’s why it is important to think about the audience, as well as the type of content you are curating. An example is the choice between Pinterest and Diigo. Both Pinterest and Learnist are very visual in their appearance, and therefore likely to suit younger student groups, groups who are disengaged or those studying very visual learning content, such as Visual Arts studies. However, Pinterest now requires a membership to see full boards; therefore, for younger students (those 13 and under, who should not have their own membership due to COPPA (Children’s Online Privacy Protection Act) requirements), Learnist may be the best tool. For older students however, this may not be a consideration. The right tool for the right purpose. Content curation tools and how to use them have been explained countless times online. One of the benefits of content curation is that you don’t re-invent the wheel; you simply share what already exists. With this in mind, I have used a number of tools to curate lists of curation strategies, curation tools and articles on curation, which I share with you below. Click on the images to access these sources. Links to articles that detail effective content curation strategies as well as how and why educators and students should be digital content curators. A curated board of tools that are effective and enjoyable tools for curating educational content. A Flipboard of curated articles and tools for those who enjoy accessing their information using this magazine style app. I have written in detail on a few curation tools in the past, including Pinterest and Diigo, and published these on my work blog, ResourceLink. Although it may take some trial and error before you find a range of tools you become comfortable with, you can be sure that once you have set up your curation accounts, and start actively selecting from the streams of information you receive, you will be surprised by how quickly you begin to build quality sources of digital content, which will be worthwhile resources for many others to access. Although curation is not ‘theft’, all of the tips that Austin Kleon shares in his book ‘Steal like an Artist’, itself a treatise on reusing online content ethically, apply to ethical content curation. A popular blog shares a post about a great resource they have discovered, which is created by a third party. Rather than linking to the blog post when curating the link about the great resource, take the time to go back to the third party’s original post and curate this link. Therefore, the creator gets correct attribution, rather than the blogger who wrote about it. This is particularly important when curating from pages which include articles like ’10 great tools for x’ – these are aggregations themselves of original work, and not the original creator. Copyright is all about protecting the income of the creator; therefore, ensure that nothing you publish in a curated list directs users away from the original, particularly if the original is a source of income for that creator. Always ensure that you attribute or reference where you sourced the original content from (again, something most content curation tools do automatically, but good to remember) and wherever possible ensure there is no way that users of your collections might mistake others’ work for your own. Curating widely from various sources, rather than wholesale replication of others’ work on your own pages is also good practice, not only to avoid the risk of plagiarism but also to ensure you are providing a resource with a breadth of perspectives and information. Seeing curation as an art is a great way to begin your journey. It takes time to develop the skills, and everyone will approach it differently; at the end, however you will have created something truly unique, and a source of content that others will enjoy and benefit from. Share your experiences in the comments box below! 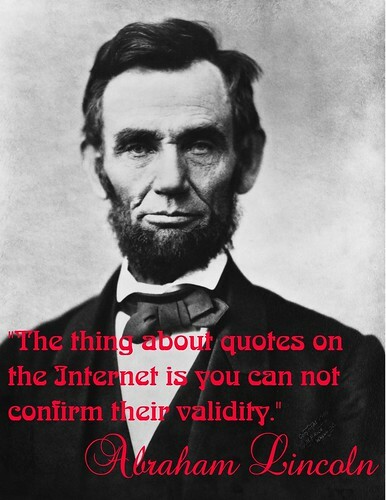 This entry was posted in Content Curation, Information Literacy, social media and tagged content curation, critical literacy, curation, digital curation, Diigo, education, information fluency, information literacy, information management, infowhelm, Pinterest, social media on March 6, 2015 by Kay Oddone. This is the first of three posts which focus on information and critical literacy. This first post outlines the importance of developing information and critical literacy. The second post will give specific strategies and tools to use when evaluating information found online, while the third post focuses on verification of social media. Slides to support these blog posts are available on Slideshare. Disturbingly, it’s not just the accuracy of assignments that are at risk by this spread of misinformation; in the past 90 days, according to this article by the Washington Post, 84 people have self-published Ebola e-books on Amazon; and almost all of them include information that’s either wildly misleading or flat-out wrong. We need to develop skills in what Howard Rheingold calls ‘Crap’ Detection – knowledge of how to find and verify accurate, useful information – or basic information literacy for the internet age. This type of literacy is something which must be taught to students, and which must be brought to the attention of anyone who uses the internet as an information source – which, it seems, in Australia at least, is most people. So what are these information literacy skills, and how do we learn them? The multimodal nature of the internet allows users to create any version of truth. You might have seen the Dove Evolution video, where an attractive young woman is ‘transformed’ into a supermodel using photoshop; more recently, a human interest reporter Esther Honig wanted to see just how much culture influences beauty, and so she had the idea to ask 40 photo editors in 25 different countries to photoshop her picture. “Make me look beautiful,” was the brief. The results show the amazing way the internet connects us, and the way technology can manipulate what we believe to be true. For students, the internet is the dominant medium and place they go to for information. In a world of information overload, it is vital for students to not only find information but also determine its validity and appropriateness. Click here to access the next post which explores Alan November’s ‘REAL’ strategy, and provides tools and strategies to apply in order to verify information discovered online. The third and final post, on critical literacy and social media is available here. This entry was posted in Learning, social media, Technology and tagged critical literacy, information, information fluency, information literacy, internet, learning;, life long learning, social media, technology on October 13, 2014 by Kay Oddone. This is the third and final in the blog series on developing information and critical literacy skills for identifying quality information online. After exploring why these skills are important, in the first blog post, and then investigating the grammar of websites in the second post, this final post provides some tools to consider when verifying information which has been published via social media such as Twitter and YouTube. A Pew Research paper on how teens research in the digital world found that 52% of students access YouTube or other social media sites when searching for information for their assignments. Although not perhaps considered a traditional source of information, sites such as Twitter and YouTube are increasingly being accessed as a ‘way in’ to complex topics. These sources too require specific skills to identify reliable, accurate and quality information, perhaps even more so that websites. This is because the nature of social media is that it is designed often for quickly uploading and sharing information; there is very little skill level required to post to social media, vs the skills needed for web publishing; therefore an even larger group is publishing content which may or may not be correct. The personal nature of many posts also means that it is very open to bias, and the social nature means that scams, jokes and misleading posts are much more likely. A fantastic and interesting way to learn more about how to verify information discovered via social media is to explore the work of the modern journalist. Often, information about breaking events is caught or reported by citizens ‘on the ground’, and is shared via social media much more quickly than traditional news services can. Therefore, for journalists reporting on news as it happens, often extensive investigation must take place to ensure the photo, video or blog post is verifiable, and not simply for notoriety or hoax value. The Verification Handbook is a really interesting read (and free to download) which shares a range of tools and strategies for how journalists verify information, using real case studies. Of course, students who are researching won’t necessarily go to the lengths that journalists go to to identify the veracity of information they find online, but it is good be aware of strategies which are easy to apply if they aren’t sure of the accuracy of information. Provenance – is this the original piece of content? Source – Who uploaded the content? Date – when was the content created? Finding this information requires the use of a combination of tools. One of the most useful tools for establishing the provenance of images is the Tin Eye reverse image search tool. Tin Eye begins with the image, and searches back, to attempt to establish where an image came from, how it is being used, if modified versions of the image exist, or if there is a higher resolution version. This is particularly useful if you have the feeling that an image has been doctored. You can install the Tin Eye plug in for Firefox, Internet Explorer, Safari or Chrome, or you can just go to the Tin Eye website and paste the image link or drag and drop the image itself. Click on this link to see some of the more interesting versions of images that Tin Eye has discovered. When looking at the source to verify who uploaded the content, there are several things to take note of. Look at the account of the person posting the information; what is the quality and content of their previous posts? Look for slight inconsistencies in their name (e.g. 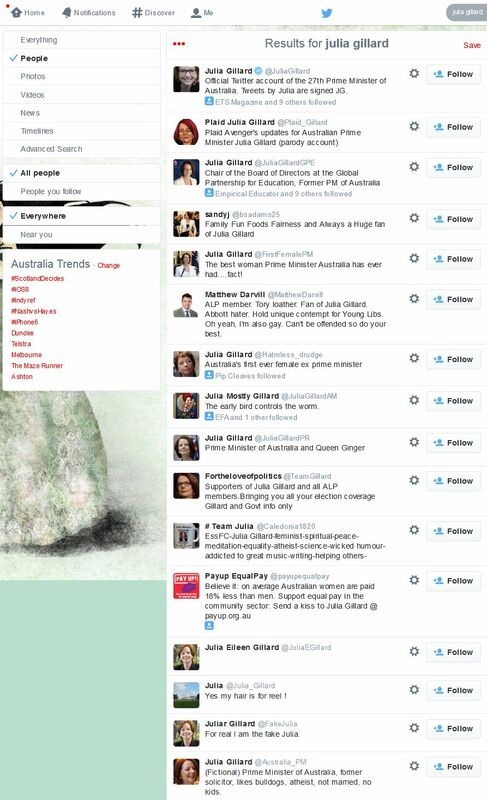 Julian Gillard), when did they create the account? You can also be guided by the blue tick on Twitter accounts which indicate that they have been verified, but this, like anything else, may be faked. More information about verified Twitter accounts is here. Who is the REAL Julia Gillard? Just doing a search for a well known person on Twitter can reveal the range of accounts purportedly belonging to the same person. This is a great activity to demonstrate how closely users need to examine accounts, and how easily one may be fooled into thinking posts are from someone from whom they are not. 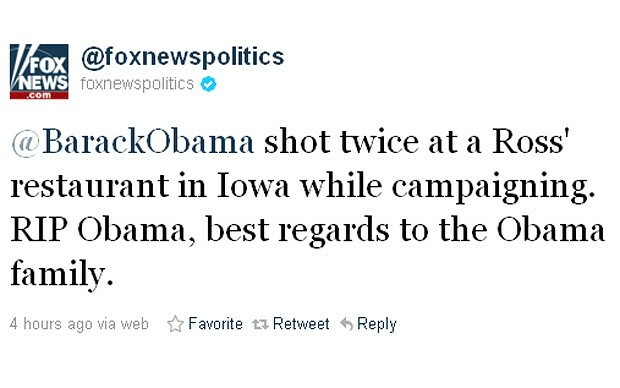 To verify the date that information was published, journalists have to go to great extremes to verify the accuracy of information they receive via social media; sometimes searching the weather at the time an photo was taken to identify a match, or using Google Maps to match background scenery to confirm the event took place where it was said to. While students aren’t necessarily dealing with breaking information, they do need to apply a little bit of critical awareness to information that they gather from social media. Simply double checking information against a number of different sources is one of the best ways to identify the reliability of information; as well as having a little bit of general knowledge and common sense. For those who wish to dig a little deeper, the Verification Handbook website has published a list of tools that are useful for verifying identity, places and images. These three posts (click for post one or two if you missed them) have attempted to provide a summary to this huge area. I have collated a list of resources and tools on my Pinterest board for further reading and information. I’d love to hear of any other tips, tools or strategies you have found useful when evaluating online sources of information. Click the image to access my Pinterest board with resources to support teachers in this area. This entry was posted in Futures, Learning, social media, Technology and tagged critical literacy, digital literacy, information fluency, information literacy, infowhelm, internet, online hoaxes, pedagogy, research, social media, study, technology, verification on October 13, 2014 by Kay Oddone. Heartbleed – it’s the wake up call we all need. The word on people’s lips at the moment is Heartbleed, and it is important that everyone who has an online account pauses to take stock. According to the Heartbleed website, the Heartbleed Bug is a serious vulnerability in the popular OpenSSL cryptographic software library. What does this mean? A great explanation can be found here; but essentially, the code that protects information which is sent back and forth from your computer to a website has an error in it, which enables a hacker to access not just the minimum amount of data that is usually sent, but possibly a lot more; like passwords and personal information. You live in a high crime area. You return home one night and realise the garage lock is broken. It appears to have been broken for some time. You can’t tell if anyone has been in the house, but you realise that you left a letter from your bank on the dining room table. If someone had been in the house, they could have taken a copy of it, and may use it to rob you at a later date. You decide to contact your bank, just to be safe. Mashable has used their considerable reach to contact many of the most popular websites to see if their services may have been compromised, and published a list of sites which may be vulnerable to the Heartbleed bug; you will be surprised by how many you probably use every day. Why is this a wake up call? 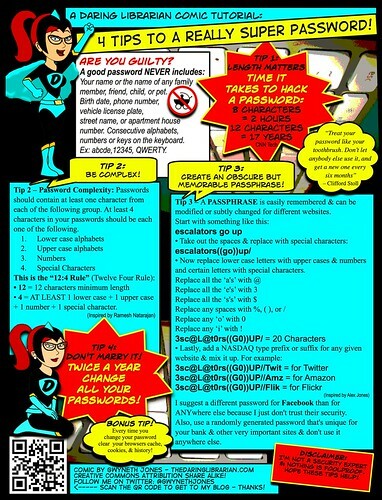 Let’s face it, we all have many online accounts these days, and we may not always take the best precautions when creating passwords, or managing them. Between email accounts, work intranets, social media accounts, online banking, online shopping and more, when you think about it, you will probably be surprised by how many online accounts you actively manage. 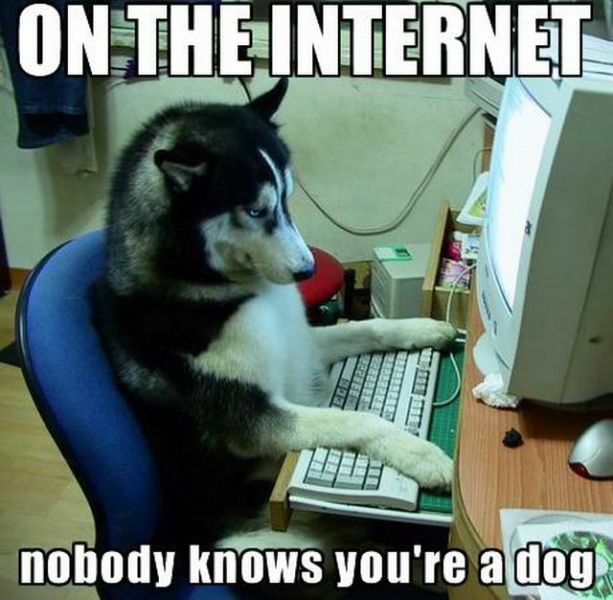 Some people handle this by using the same password for every account. Others by writing every account down in a notebook. The worst way is by using sticky notes which attach to your computer screen. Not only do practices such as these put your own data at risk, if you are an educator or parent, it also models very poor security to your students or children. While topics such as cyberbullying and internet addiction get a lot of media coverage, it is little things, like password management, which are so very important, and yet so easily overlooked. Practices such as the teacher openly sharing a password with students, or publicly consulting a written list of usernames and passwords do nothing to promote good security behaviours to students. Using a password manager such as Keepass or Lastpass or Dashlane, makes it easier to manage multiple passwords; teaching students about tools such as these is vital. With increasing numbers of services being delivered online, internet security, and having solid strategies for protecting personal information through the use of strong passwords is an absolutely necessary part of the knowledge set every individual needs. One of the most important lessons students need to know; never enter your password anywhere except in a secure password manager and into the site which actually requires it; sites that allow you to enter your password to test its strength may not be secure – even Intel’s password checker site has been questioned. Tools which are installed on your computer, such as Keepass, allow you to test your password strength in a safer environment, and even better, will generate passwords randomly. Although it links to the US Curriculum, the links to the Australian curriculum are clear: in the Information and Communication Technology (ICT) capability, it quite clearly states that by Year Four, students should be able to apply digital information security practices – making specific reference to the development of secure passwords. This content is no longer an optional extra for students today – and bugs like Heartbleed are reminders of this for all of us. This entry was posted in Communication, social media, Technology and tagged cybersafety, digital citizenship, digital literacy, heartbleed, ICT capability, information and communication technologies curriculum, internet, online safety, password managers, password safety, social media, web security on April 14, 2014 by Kay Oddone. I don’t know if the Apple advertisement’s claim that more photos are taken with the iPhone than any other camera is completely true – but I do know that we are taking more photos than ever, and more often than not, we are using phones to do it. If you asked anyone about ten years ago if they would ever use a phone to take a photo, they would have looked at you as if you were daft. The two tools don’t seem connected in any logical way. Apart from futuristic ‘video phones’, the idea of a lense on your phone, which is essentially a voice driven medium would have been the furtherest from people’s ideas about the future of telephony. Added to this is the ability for the phone to store hundreds of photos. They have replaced Grandma’s little photo album of the grandkids, and at gatherings you often see people clustered around a phone’s tiny screen, viewing someone’s favourite pet or last night’s antics. The fact that we now all carry around a camera with us in our pockets has changed so much. When the police wanted to find the suspects of the Boston Bombings, they didn’t have to rely solely on security camera footage (although it was cctv footage that eventually led to their identification) – they appealed to the public, seeking photos and video people had taken on their phones which may have inadvertently captured suspicious behaviour. Likewise the veracity of referees’ decisions was called into question last week, when French Open tennis competitor Sergiy Stakhovsky took his phone from the sidelines, to photograph the mark left by a ball he claimed was not out. Now that we are not limited to 12 or 24 exposures, as used to be the case with film, there is no reason not to take photos everywhere and of everything. We can use this capability in so many ways – and like everything, there are positives and negatives. Our students now carry a powerful learning tool in their pocket all of the time. They can record their learning, capture an ‘aha’ moment and reflect upon it, create beautiful images and share them, build a history of their experiences far beyond what we have done in the past. With this great tool, however, they can also create tremendous havoc. Everyone makes mistakes, and we should be able to learn from them and move on, not have them haunt us for the rest of our lives, captured forever in digital format. Photos that are taken on the spur of the moment and shared online will never ever truly disappear – no matter if they are deleted from a newsfeed or supposedly ‘self destruct’ in a chat service. And so yet another avenue for solid digital citizenship arises. It’s difficult to get students to stop and think before taking rash actions – and even more so when they are with friends, at a party, caught in the moment. However it is vital for them to understand the responsibility that comes with being able to record a moment in time forever – and the power they wield with just one tap of the camera button. This entry was posted in Communication, Futures, Technology and tagged cameras, communication, cybersafety, digital citizenship, photography, social media on June 2, 2013 by Kay Oddone. These six words form the basis of a fascinating forum which exists on the popular social media site Reddit. In everyday life, most of us move in relatively small circles – and if we do meet someone who has had an extraordinary life experience, or who has a unique lifestyle or career, often social mores limit just what we can ask. The anonymity of Reddit means that readers feel freer to ask what they really would like to know, and the rules of the AMA (literally, Ask Me Anything) means that the responses are more likely to be honest. It was this recent AMA, from Greens Senator Scott Ludlam that prompted this post. While some AMAs are purile, many others are providing access to individuals that ‘average’ people would never be able to contact. Upcoming AMAs include Mason Peck, NASA’s chief technologist, Gillian Anderson, actress from THE FALL, Hannibal and The X-files, Major Blaine Jones, the lead solo pilot of the U.S. Air Force Thunderbirds, and Roger Federer, Professional tennis player. Their discussions, answering questions from everyday people, not only creates a wealth of hitherto unknown information, but also makes these people more human, as they relate their stories and interact with the readers – a far more intimate and involving experience than what was previously available only through magazine articles and television interviews. As an increasing number of celebrities choose to do AMAs (Barack Obama brought Reddit to a standstill when he participated: I am Barack Obama, President of the United States — AMA) a level of proof of identity is required. This is difficult to fake, and if there is any whiff of insincerity redditors (and the moderators who manage the communities) are quick to jump on it; this was evident during the recent Morgan Freeman AMA, where the photo evidence looked dummied up and the responses appeared to be from a publicist rather than the man himself. So what does the AMA mean for access, open communication and the ability to access primary source information? Simply, it is a new way for those in positions of authority, for those with unique life experiences, for those who are famous to share their stories more directly with others who might never meet them normally. It takes the concept of a campfire chat and distributes it across the globe. It democratises access and allows ordinary people to ask the questions that they really want answers to. It allows us to learn more about other peoples’ life experiences, their thoughts, their opinions and their beliefs, and it creates a unique source of primary information that will be archived online. Imagine if Neil Armstrong, Christopher Columbus, Mother Theresa or Margaret Thatcher had completed AMAs – what a trove of information we would have access to! This entry was posted in Communication, social media, Technology and tagged communication, information, reddit, social media on May 16, 2013 by Kay Oddone.